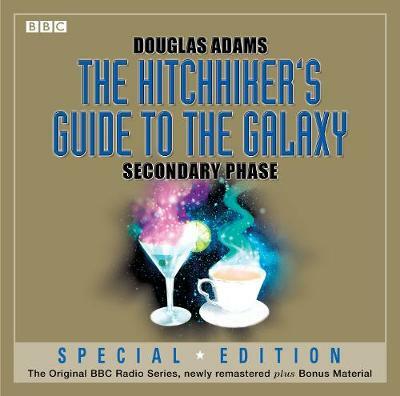 The second original series of The Hitchhiker's Guide to the Galaxy has been remastered by Dirk Maggs (director of the Tertiary, Quandary and Quintessential Phases) to give a full, vibrant sound, now with Philip Pope's version of the familiar theme tune and specially re-recorded announcements by John Marsh. Stranded on Prehistoric Earth since the end of the first series, Arthur Dent and Ford Prefect are once again trying to hitch their way off the planet. Zaphod finds his visit to the offices of the Guide rudely interrupted by Frogstar fighters, who further threaten to feed him to the Total Perspective Vortex. Eventually reunited, the three fetch up on the planet Brontitall and discover the indigenous species in something of a flap. Arthur meets Lintilla (several of her), Marvin gets to be a hero once again, and there is a meeting with the Man in the Shack who apparently runs the Universe... Peter Jones, Simon Jones, Geoffrey McGivern, Mark Wing-Davey, Stephen Moore and a full supporting cast star in these BBC Radio 4 episodes. Also included is a bonus 50-minute interview with Douglas Adams - who died in 2001 - in which he discusses his career and work. 4 CDs. 4 hrs.